From 17 century Dieppe, small town in Normandy ( France), became a major center of ivory trade and carving in Europe. Among countless intricate articles, beautiful ship models were made, especially during and after Napoleonic wars. These miniatures are often described as prisoner-of-war ship models, but completely different in style and construction. 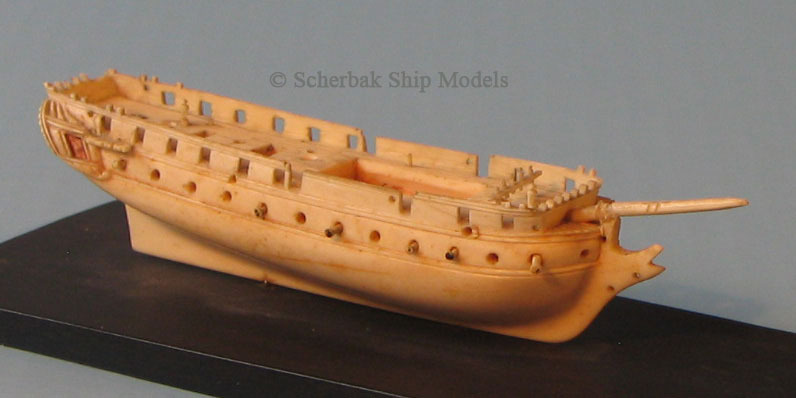 Dieppe ship models were made completely from elephant ivory brought to France from West Africa. Hull was carved as solid piece, with details attached. Even sails and ropes were made from ivory! Miniature Dieppe ivory ship model of the frigate shown here is from our collection. The hull is only 4 3/8in (11 cm) long. We thoroughly research techniques of sailing ship modeling of the past. We use them in our own models of frigates, ships of the line and other sail vessels, made in extreme miniature sizes, comparable to Prisoner of War or Dieppe smallest ship models. Take advantage of our Layaway Plans.